Comfortably furnished townhome nestled in the trees. Light filters through the tall trees and bathes the living room in light through the cathedral-style windows. 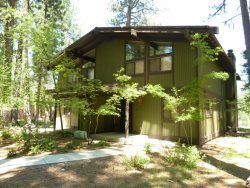 The high-beamed ceilings are accented with the redwood trim and native-rock fireplace offering the flavor of mountain living at its best! Fully-stocked kitchen will please the chef in the group! Private, fenced backyard located adjacent to a greenbelt perfect for relaxing after golf or entertaining in the evening. Another great week in Graeagle. Comfortable home...kitchen has everything for cooking.